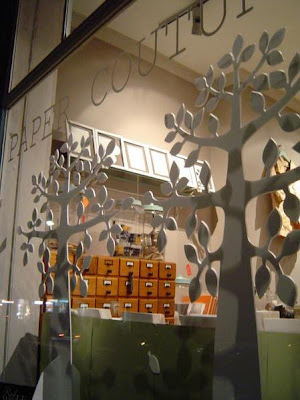 I don't recall where I first came across Paper Couture, a lovely paper goods shop in Paddington, Sydney, but oh how I wish I was winging my way there right this minute. 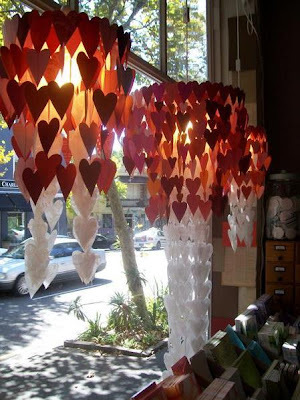 Taking in a bit of summer warmth would be heavenly for this northern-hemi girl, but so would a chat with the boutique's owner, paper artist Jo Neville. Paper Couture is known for its bespoke stationery (a new word for me - bespoke means custom-made) ... correspondence, weddings, and events. In addition to working with beautiful papers, Jo delights in adding a touch of sewing thread to her simple, but elegant designs from time to time. When studying graphic design at Swinburne University in Melbourne, Jo discovered she enjoyed 3-D design. She's pleased now to have returned to it after a number of years creating annual reports and logos for corporations. In addition to designing large-scale paper installations for corporate and private clients, Jo likes to create clothes from paper, such as the signature coat and skirt that are displayed in her shop. She's even sewn wedding dresses from white Tyvek and relishes the rustle they make when modeled. 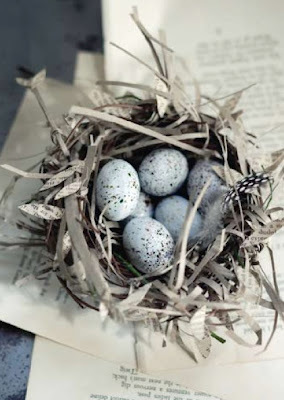 Jo says she loves paper because it is sensual, tactile, and captures some of our most treasured memories. I couldn't agree more. See more of Jo's work on Paper Couture. Ann, thanks for featuring Jo and her lovely Paper Couture shop, I can't wait to go to Paddington and visit Jo for a closer look at her Paper creations! I love cirles too!! 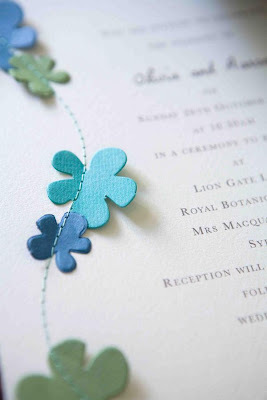 Those little flowers stitched to the invitation are SO sweet!! I am amazed at all of the amazing things you can do with paper. Love it! I'm interested in the paper flowers sewn onto the invitations. How did you start and stop the threads so it looked finished?